Hồ Chí Minh, born Nguyễn (a common Vietnamese last name) Sinh Cung, (May 19, 1890 - September 2, 1969) was the leader (Prime Minister from 1945-1955, and President from 1945-1969) of the Democratic Republic of Vietnam (later the Socialist Republic of Vietnam). President Hồ Chí Minh was like the Vietnamese George Washington. He devoted his life to independence and liberty for the Vietnamese people. He would lead Vietnam through decades of war against foreign invasion to independence, which came several years after his death. 'Hồ Chí Minh', meaning 'Hồ with the will of light', was not his real name. He took this name around the time of the August Revolution in 1945. His name was Nguyễn Sinh Cung when he was born. At age ten, he changed his name to Nguyễn Tất Thành, according to Confucian tradition. He would later use many 'pseudonyms' (false names). Other than 'Hồ Chí Minh', his most famous name was probably Nguyễn Ái Quốc meaning 'Nguyễn (by far the most common Vietnamese last name) who loves his country'. Vietnamese people commonly refer to him as Bác Hồ (Uncle Hồ). Nguyễn studied in Paris from 1919-23. In those four years, he started following communism, and began to believe that Vietnam- then a French colony-should be independent. During this time he wrote a letter, which was ignored, to United States President Woodrow Wilson, asking for U.S. military aid to help overthrow the French colonial rulers. He joined the French Communist Party, and started visiting Moscow regularly, as a member of the Asian branch of the Comintern. Hồ led a revolution against the French rulers of Vietnam from 1945-1954. After overthrowing the French, a Communist regime, supported by the Soviet Union and China, was set up in the northern half of the country, with himself leading the country as both President and Prime Minister. A non-Communist government, supported by the United States, was set up in the southern half of the country, because the United States did not want all Vietnam to be Communist. This was because the United States was then fighting the Cold War. 1946 appeal from Hồ Chi Minh to U.S. President Harry Truman, asking Truman for aid in fighting French. When South Vietnam and America did not keep their promise to hold an election and unite the two halves into one country, Hồ led Vietnam into a military and political struggle to bring the rice fields of the South under his Communist rule. Two decades of war followed, killing millions of Vietnamese. The United States supported South Vietnam with military aid, while the Soviet Union (led by Nikita Krushchev and then Leonid Brezhnev) and People's Republic of China (led by Mao Zedong) continued to support North Vietnam's war effort. In the end, North Vietnam won the war several years after Hồ Chí Minh died. Suffering from diabetes and heart problems, Hồ Chí Minh died on the morning of September 2, 1969, of a heart attack. In his will he said he wished to be cremated and have his ashes be buried in hills in the north, center, and south of Vietnam. After he died however, his followers embalmed his body and put it in a tomb, the mausoleum, where he is still worshipped today. In 1976, in the style of the Soviet Union, the victorious Communist North renamed the capital of the non-Communist South, Saigon, to Ho Chi Minh City, in honour of their leader. 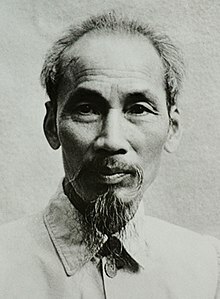 Wikimedia Commons has media related to Ho Chi Minh. This page was last changed on 21 September 2018, at 06:11.